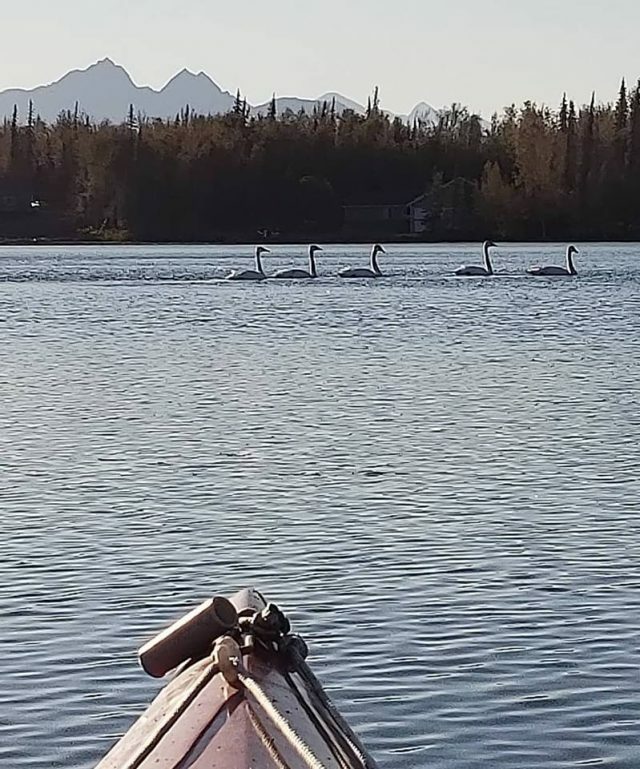 Have you ever been to Alaska? I’ve always wanted to go and this summer my opportunity came. Don’t worry, we’ll get to the recipe shortly. First, a little bit about Alaska. The organizer of Alaska Vegfest, Delisa Renidio, wrote to me several months ago inviting me to be a presenter at this year’s event. 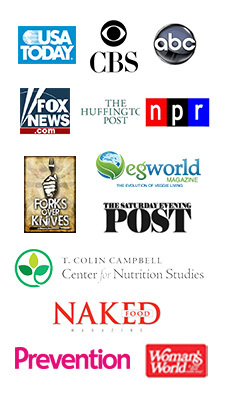 Alaska Vegfests are unique in that they invite just three presenters and focus on a special topic. This year’s topic was How to Live a Vibrant, Brain-Healthy Life. Dean Sherzai, MD, and Ayesha Sherzai, MD, are neurologists and co-directors of the Alzheimer’s Prevention Program at Loma Linda University. They have recently released a ground-breaking book, The Alzheimer’s Solution: A Breakthrough Program to Preve t and Reverse the Symptoms of Cognitive Decline at Every Age I was delighted when Delisa told me that they wanted me to be the third presenter on board, bringing the topics and expertise of The Mindful Vegan book to the program. It turned out to be a splendid combination. 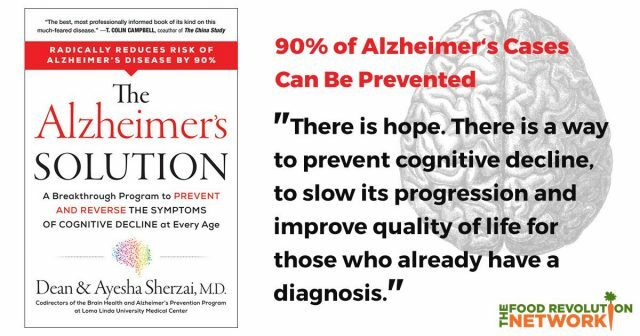 The Sherzai’s work focuses on how lifestyle affects cognitive decline and particularly Alzheimer’s disease, both preventing and slowing its progress. 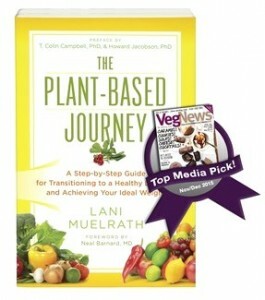 The research they have done is deep, and the unmistakable conclusion is that the lifestyle choices that make a big difference to our advantage are: plant-based nutrition, minimal processed sugars and saturated fat, low in added oils, along with the all-important regular physical activity, sitting less, social engagement, sleep, and meditation. After hours our hosts Delisa and Charlie Renidio gave us an Alaska adventures of a lifetime. 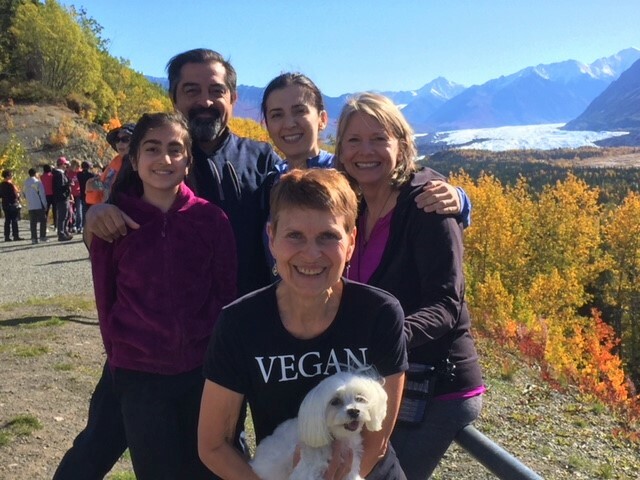 They drove Dean, Ayesha, their daughter Sophia and myself to visit glaciers (see below, with Delisa and her dog Heidi). I was in Alaska at the Renidio’s home (which also houses, downstairs, a vegan BnB. Lakeside Gardens BnB. I highly recommend! 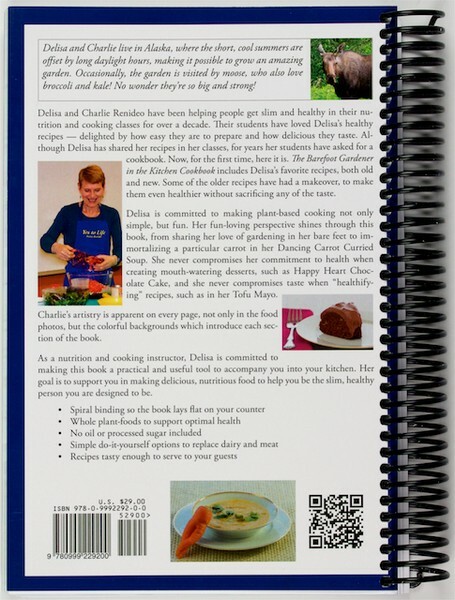 Delisa and Charlie also have a massive organic garden, cook great food like there’s no tomorrow, and have even published a cookbook, The Barefoot Gardener in the Kitchen Cookbook. The Sherzai’s and I managed to plow through several loaves of bread, mountains of salad, batches of vegan cheese, and heart-warming soup while we were there. Delisa has put a couple of fresh spins on homemade whole wheat bread that I particularly like. 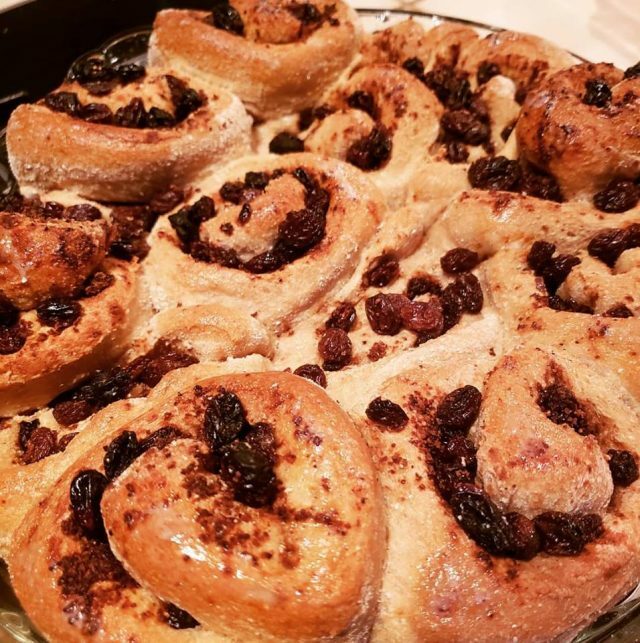 Not long after I returned home, I mixed up a batch of her dough and shaped it into cinnamon rolls, which I sweetened with raisins and date sugar. They came out so scrumptious that I asked Delisa if I could share her recipe with you for the bread, and she enthusiastically said yes! 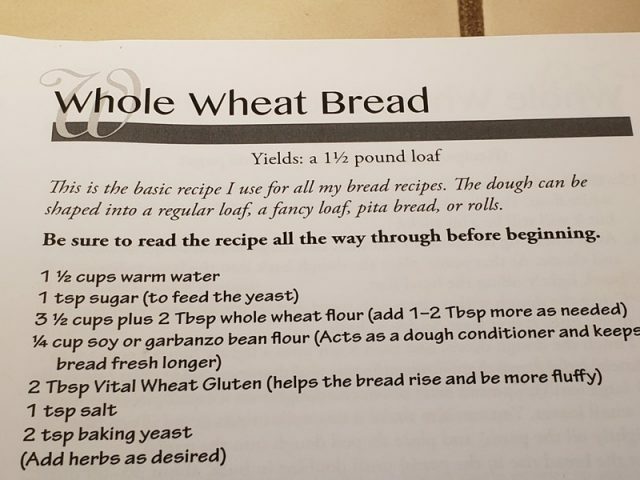 The only thing I did different from the recipe below is that I replaced half of the water with almond milk, and instead of forming it into one loaf, I rolled the dough out and spread the raisins and date sugar on before rolling them up. 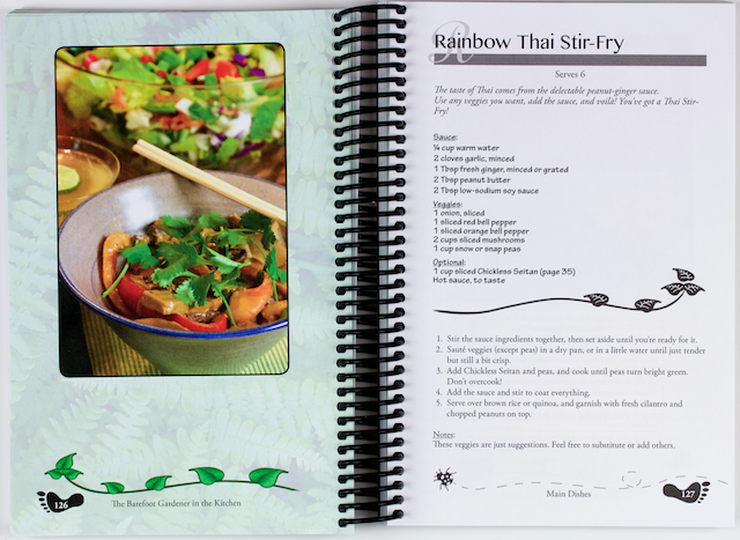 To make it easy, I simply snapped photos of the recipe pages in the book. Here you go! 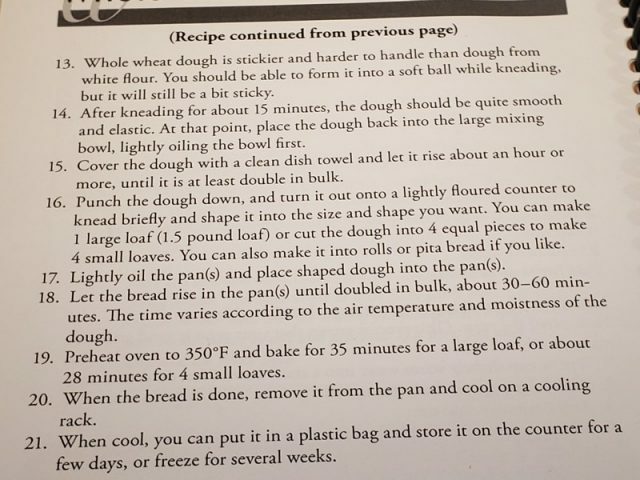 I used my Zojirushi Bread Maker.^dough cycle which takes about an hour and fifty minutes until the dough is ready to be shaped into rolls. I placed the ball of dough on a lightly floured wood board, punched it down and rolled it out to about twelve inches by ten inches. Then I sprinkled a couple of handfuls of raisens and a couple of tablespoons of date sugar and perhaps a couple of teaspoons of cinnamon (sorry, didn’t measure, go with what you like!) and spread it around on the dough. Then I rolled the dough up and cut it into about a dozen equal size slices. They seem like they might be too thin when you slice, but these puppies rise so they will be plenty big. Then, I placed them in the dish to rise for about an hour before baking at 350 degrees for about forty minutes. My oven is a bit old and limping along somewhat so it may take more or less time for you. 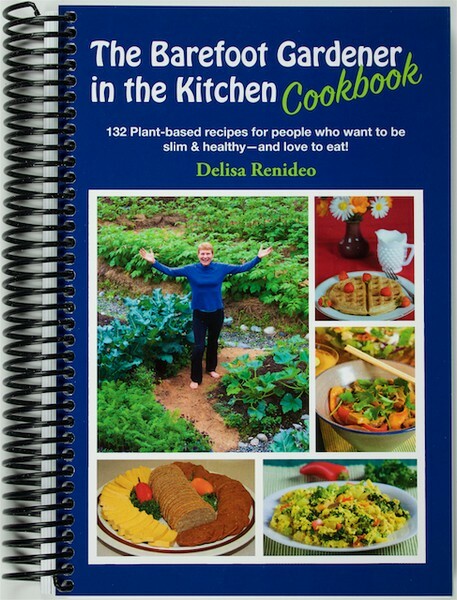 Delisa’s book is a delight and I’ve already made about four of the recipes, though I haven’t been back home from Alaska that long! Enjoy the recipe here, and may your journeys take you some day to Alaska! *I have an old Zojirushi model that I have used for years that isn’t quite like the ones on the market today, but they do the same thing. 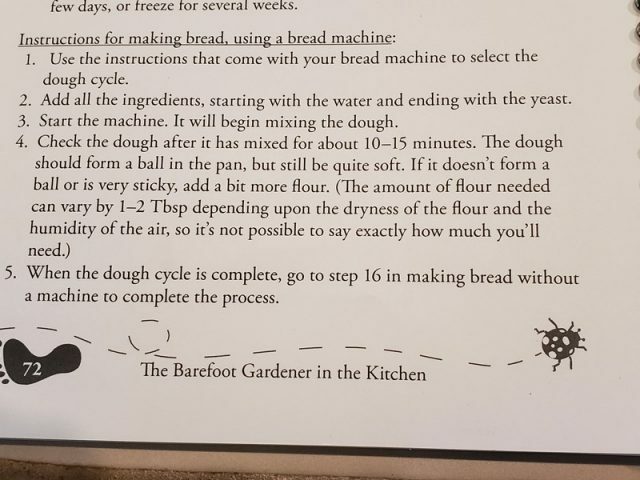 If you have a breadmaker it is quiet possible that it has a dough cycle of its own. I received your email re: the cinnamon roll recipe but both links in that paragraph failed. 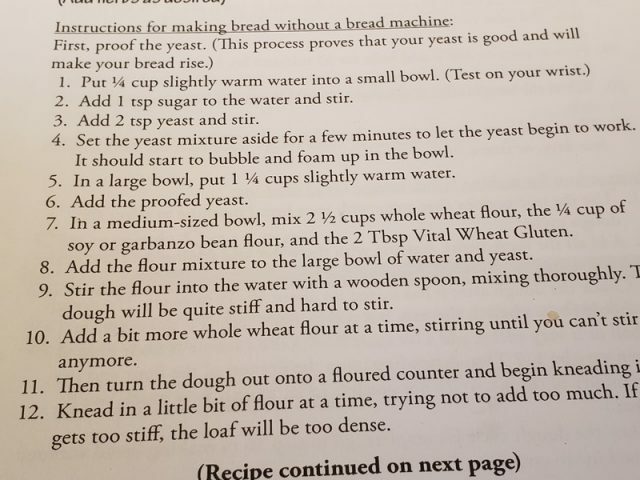 I see the incredible pic of the cinnamon rolls here on your site, and the bread recipe, but not the cinnamon roll recipe! Am is missing something obvious! Thanks so much! I appreciate everything you do! Congrats for being the reader of your lates book! It’s always so much better when the author reads!!!! There you have it! I just rolled it out into a rectangle and sprinkled raisins and dates. I am sorry the links didn’t work for you from the newsletter. I have not received that from anyone else – but you did find your way here! Let me know if I can be of any more help with the recipe. 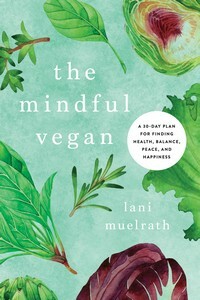 And THANK you for your congrats on the audio version of The Mindful Vegan! It means a lot to me! JJ, I just added more details to the cinnamon rolls preparation at the bottom. Hope this helps! Both links in the paragraph failed for me too. I had to scroll to bottom of page and go to …go to recipe and todays article. So sorry about that! I have only had a couple reports on this and can’t figure out the problem as all links in the newsletter work fine for me. I appreciate the alert! The rolls look great, but would be easier if I had the amounts of cinnamon, raisins and date sugar, how wide the slices are when you cut them, and how long to bake. Thanks for everything you do, Lani! Candace, you are right! I just added more details to my recipe for you, you’ll see them at the bottom. I didn’t measure as I went so all are approximations. Thanks for the suggestion to add more details! Let me know how your batch comes out!